If you are inspired to make the perfect Korean taco, travel in space, swim the Bering Strait, create legendary ice cream or create digital fantasy worlds, you could get more than a few tips from the speakers at the 10th anniversary edition of ciWeek. The event, this year themed “Small Steps to Giant Leaps,” returns to Des Moines Area Community College’s West Campus March 4-8. It’s open to anyone. We interviewed five of the speakers in advance to look for inspiration that could help you in your own business. 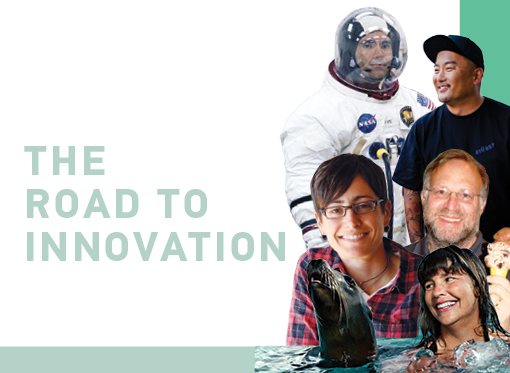 You’ll find our interviews with food truck pioneer Roy Choi, Apollo 13 astronaut Fred Haise, Ben & Jerry’s co-founder Jerry Greenfield, endurance swimmer Lynne Cox and Pixar digital lighting guru Danielle Feinberg. Also appearing this year will be former Facebook exec Randi Zuckerberg, “First Man” author James Hansen, cryptocurrency expert Brian Nelson, “We Came in Peace for All Mankind” author Tahir Rahman, Entrepreneur magazine editor Jason Feifer, space historian and author Rod Pyle, Apollo flight director Gerry Griffin, and Apollo astronauts Al Worden and Walt Cunningham. The most important thing for me that worked is to be honest, trust your vision and work hard. There is no paycheck coming unless you work hard. The turtle wins the race. You have to be honest. Everything is not about money. It’s all what you share with the world and how you follow what you truly believe. What was the career turning point for you? My situation was unique. In 2008, I lost my job in the real estate crisis. I started selling tacos on the street, and it just took fire. I never planned to be an entrepreneur. I was in a moment. All of a sudden there were flash mobs, blogs and mainstream media. In six months, the world changed. People started food trucks, from London to Philly to Los Angeles. I didn’t think about what it would become. We started making 200 to 300 tacos a night. We wanted to sell out. Then we sold 2,000 to 4,000 a night. If there hadn’t been social media, we might just be selling tacos on the street. It was a perfect storm. Why did you choose the gourmet angle on food trucks? We channel the original tacos. We are the children of the original taco trucks. They are our spiritual ancestors. We are the children, the new family tree. We are still out on the streets with the original ethos, and we certainly put our trust in the same place. It is our core and DNA. We are very much old school. We make L.A. tacos, four-inch burritos, spicy with salsa verde. We add Korean flavors. We are re-creating the East L.A. tacos. Do you agree that trying times bring innovation? Before 2008, there wasn’t much on YouTube. In 1989 and 2008, there was desperation. You had to come up with your two-minute offense. That doesn’t mean that new creativity can’t come from normal situations. Maybe you don’t give up everything. Maybe you work double time. Then you have nothing to lose. You keep your main job. It’s very hard to wake up and say, “I quit.” There are other ways to do it. It’s like playing in a band on the side. Don’t get settled on the idea that the day ends at 5 o’clock. Time blends a little more. We are interconnected with technology. We are anchored with ideas that come from the the ’50s — the white picket fence and the 2.5 kids. You have to break away. Ideas come at 2 a.m. It’s OK to be 9 to 5, but to be an entrepreneur you sometimes work at 2 a.m.
I’ve made a lot of mistakes. I haven’t grown as much as a business as a heritage. Everything is about scalability and growth, bigger is better. We decided we wanted to go our own way and make our own way. In L.A., we still have four trucks and two restaurants. We are self-funded — no loans. We are healthy. We employ 70. People will trust us forever. Maybe I could have grown and be a multibillion-dollar operation. For us, it is a culture and a movement and a relationship. We are kind of old school in a new school. We are a blacksmith in a computerized world. We have money in the bank to do what we want to do. We bring joy to the world in every taco or burrito. Entrepreneurism doesn’t just mean financial rewards. You have to evaluate what really means something to you. By being true to Kogi (his taco company) we have been able to open other doors. You think you have one shot. It’s not. I want to create a production company. And a creative agency. And a design firm. It opens up a kaleidoscope of opportunities. Why have you decided to be a mentor? When I was in computer science at Harvard, the class was about 10 to 15 percent women. You were overcoming something just walking into the classroom. You felt like you didn’t belong. At Pixar, I explain my job and girls’ eyes light up. I could get them excited about math and science. There will be a point when they aren’t. It’s pretty powerful to see that you can talk to kids and get through to them. Why did you take this career path? In fourth grade [in Boulder, Colo.], they taught programming. We learned Logo computer language, and the turtle drives and draws a line. I was totally into it. I took a BASIC [language] class later. One of my hobbies was programming. I fell in love with it before anyone told me I should not do that [because girls were discouraged in the field]. By the time they told me, I didn’t care. I wanted to be an engineer, but I decided to go into computer science. I started in a job in San Francisco [as a programmer for Design Media doing “programming for people who don’t do programming,” which bored her]. “Toy Story” was the animation standard, and Pixar was the only place doing that kind of thing. A friend told me that “A Bug’s Life” was coming. “You are applying,” she said. I read a study that said men need three out of the 10 of the employers’ targeted attributes to get a job. Women need seven of 10. I grew up in a family where my parents said, “Find the things you love, and that’s what you do.” I love math, science, computers. I like many things. Why is getting interest in STEM fields still a battle for girls and women? There has been so much hard work put into this in the past decades. It takes a while for things to take hold. When a classroom is full of mostly boys, it sends a message. But slowly those ratios change. We have to keep working at it. What central messages do you offer students? First, see the amazing things you can do. A lot of what happens is you narrow your interests. A 13-year-old said, “I want to be a lawyer.” I said that’s too early. You can pick a major in college. Do you see gender discrimination in workplaces? It’s still a battle. There has been a lot of craziness in the past that brought attention. Pixar is a great place with a great culture. I haven’t experienced what some people do. People say things that they really don’t know are hurtful. You don’t want it to ruin a career. A lot of it is unintentional, but you have to watch for what is intentional. It’s incredible. It’s super different. The animation rules don’t change. But now there is a graphic interface akin to Photoshop. We work in a much smoother way. Doing a hundred ants is hard. On “Monsters, Inc.” the hair was tough. On “Finding Nemo,” who knew how you do water? We’ve made huge progress on what we can do on the screen. It feels like we can tell any story we want. The director can dream up anything. I love the connection with students. They get so excited. These are some of the most talented people on earth, and they aren’t going to be held back by silly things. When I toured the Ben & Jerry’s south of Burlington, Vt., years ago they talked about the fact that their ice cream has less air pumped into it, making it smoother. Why? Ben and I took this correspondence course on making ice cream and we began experimenting. People were trying to make ice cream cheaper to make by adding air and using artificial ingredients. We wanted to go back to the homemade ice cream tradition. We had our name. We started on a very small scale. You don’t need to be an expert to start. You use creativity at a small scale. Starting a venture can be intimidating. People think they need to have everything figured out. You don’t. How did the company change over the years? It completely transformed. We had one shop. We were making ice cream in 5-gallon containers and freezing it. Our company grew. We changed operations and started selling packaged ice cream at higher volumes to distributors and grocery stores. The company adopted a formal mission. We had a social mission to help with social and environmental issues. Those were a driving force for 40 years. Neither one of us had a traditional business background. We view business as organizations that aren’t about themselves. We were neighbors in the community. You sold to Unilever, a massive international company. Did those social commitments remain at Ben & Jerry’s? I would say we were both pleasantly surprised. I would say for the first five to seven years, Unilever didn’t really pursue those missions. They were integrating Ben & Jerry’s into the rest of the business. But things are very different now. Paul Polman, who just left as CEO of Unilever, had a sustainability plan for the company. You had a reputation for valuing the staff. How did you approach that? We were fairly innovative. We paid a living wage to our full-time employees. We gave them up to 3 pints of ice cream a day. I would say we treated the employees well. You asked them for flavor ideas, too, right? We asked employees, but we also got ideas from customers, Ben & Jerry’s fans. Cherry Garcia was one. So where Chunky Monkey and Chubby Hubby. People have an emotional attachment to ice cream. They have their favorite flavors. They associate it with birthday parties. It’s like Apple devices, as far as that attachment. All we were trying to do was be honest and be ourselves. We created Ben & Jerry’s. We didn’t have the money to come up with a story. We put our photos on the package. We were regular people. There is still opportunity for small businesses just as there was for Ben & Jerry’s. My experience there is still unlimited opportunities for someone with an innovative idea and a way to communicate it. If you are coming up with an idea and everybody says you are crazy, don’t be dissuaded. I feel that if people and companies were more cooperative than competitive, the world would be a much better place. There’s not winners and losers. We are on the same team. When you were 15, you swam from Catalina Island to mainland California. Later, you swam from the U.S. to the Soviet Union in the Bering Strait, a few years before the Cold War ended. You swam in Antarctica. How do we chase dreams? A big part is to have a goal. Then you plan the steps to get there. One of the key things is to find a mentor or two or three. That’s what I did. It’s never a straight line. There is a learning curve that happens. You have to refocus along the way. You have to figure out how to stay the course with one idea and do something persistently. You have to change strategies if needed. That was one of the things with the Bering Strait. I met people who believed it was impossible. I found people, one at a time, who thought it might be possible. You have to build a team. You need to network. This applies to business. You need a team that you can trust and depend on. It’s a fluidity. I talk to corporate groups all the time. A big athletic challenge is like a big corporate challenge. It’s about team-building. If you realize that a team member is not positive or helpful, you have to let go. I had a physician on an Antarctica swim who was more concerned about being on TV and saying I could die than anything else. I do not want to deal with negativity. Who do you surround yourself with? Are they using their talents to achieve what you want? I have done stuff that is extreme and physically and mentally challenging. It’s about mental toughness. Is that in your DNA or do you learn it? It’s both. When I was a kid, I saw the training athletes and saw the coaches. I had great parents. My older brothers were great swimmers. We moved from New Hampshire to California to swim for Olympic coaches. [Olympic swimmer] Gary Hall helped me with my butterfly form. There was so much success. I was willing and determined. You can develop mental toughness. You can emulate the greats. How do you power through to meet your goals? When I was working on the Bering Strait, it had been closed for 48 years. It took me 11 years to get permission from the Soviets. I believed the swim could change relations between the U.S. and the U.S.S.R. You don’t give up on it. It’s day to day when things are falling apart that you wonder. But you keep reaching out to someone else. [Oil giant] Armand Hammer helped me with the Soviets. Sometimes an impasse is just a way to something else. You mentioned that a young boy once asked you what you do when you don’t reach your goal. What was your answer? First, figure out what to do differently or maybe you don’t want to try again. Sometimes it’s a challenge. I swam the Nile River. The Egyptian government invited me. I got sick from the water and almost passed out. I landed in the hospital and they had to put me on muscle relaxants. They invited me to try again and told me the water was OK. It wasn’t. I declined. It sounds like you still swim. As long as I’m breathing, I will swim. I go out in the ocean bay. I’m training to stay in good health. I swim across lakes as I travel. I swim now because I love it. I can still swim. My friend is 95, and she swims March to November. You mentioned some thought you were crazy to swim at Antarctica, across the Bering Strait, around the Cape of Good Hope in Africa, across the Strait of Magellan in Chile and, in record time, across the English Channel. You did it anyway. Why? People said I was too young when I swam across from Catalina Island to the California mainland as a teenager. When I swam in Antarctica at age 46, they told me I was too old. It’s just who I am. Why would I stop? I wanted to explore what I could accomplish. I went to far-out places in the world. I’m curious. You started out pursuing a journalism career, but shifted to aviation when you served in the Korean War. As a test pilot, you crashed in 1973 and were burned over most of your body. After 14 months of recovery, you continued your career. That led to NASA and your work on Apollo 13, which was crippled by an oxygen tank explosion in flight and sent you on a mission to survive that became a Hollywood movie. Why did you decide to pursue space exploration? I was going to major in journalism. I was going to work for a newspaper. I was on the school paper, sports editor and editor of Bulldog Barks [in Biloxi, Miss.]. The Korean War came, and I wanted to serve. I was 18, and naval aviation cadet was all I could do at 18. I graduated from high school at age 16. It was the only thing that fit. It was that interest in aviation that changed my career. Eventually I got an aeronautical engineering degree from the University of Oklahoma. I enjoyed math and science and physics. I ended up becoming a test pilot, and that led to NASA. How did you approach dealing with roadblocks, disappointments or failure when they occurred? It’s not unexpected to have situations and problems. I’ve been on fire a couple of times in planes. In the Apollo program, all the missions had problems. We almost aborted [Apollo missions] 14 and 16. We had workarounds to get them to land. It’s kind of the nature of the business. Most of our training was to test us. It’s no different than in anything in life. If you have a problem, put it on the table and systematically decide how to deal with it rationally. On [Apollo 13], the strongest emotion for me was I was sick to my stomach with disappointment [at not getting to land on the moon]. I had a knot in my stomach. Did you think at any point you might not make it back? We never faced a point where there wasn’t anything else left to do. You have doubts that you are going to get back before you leave. We all had to make arrangements head of time [in case they didn’t return]. When Apollo 19 was scrubbed in budget cuts as you trained for the mission, how did you handle that? We had been training for four or five months. It was a disappointment. That was one of those things in life. You get beyond it. I feel I was very fortunate to have my career at that time. I don’t feel disappointed now like I did then. What was it like seeing the moon and Earth from space? The views out of the window of the moon and the Earth — at times you say, “Am I really here looking at this?” Zero gravity was strange, too. What are the next steps in the space program? Going to the moon is not going very far. For the technology we had, it was a big step. Will we go to Mars? We should continue exploring and stay within the technology. Mars would be a very tough mission. With our technology it is a long way away. It would take a long time to get there. A permanent base would be very difficult. Right now it’s mission impossible to go nearly 2.5 light years. How do we address the shortage of STEM workers? There has to be a better job done between parents, teachers and mentors in exposing students as they are coming up. The appropriate students that have the right side of the brain. My granddaughter struggles with that. We need to make sure they take advantage of that talent. When you address company executives, what inspirations do you share from your experiences? Create a team that has the right skill mix appropriate for a goal. Have that goal well established so that on a continual basis you continue working on keeping them motivated and steered to the goal for the business at hand. Don’t become complacent. Set project goals. When I won contracts [as an executive with Grumman Aerospace Corp.], I spent a lot of time making sure I had the right mix on my team. They were very intense efforts.